Friday night I spent the night at Chantell Perry's house! She has a big apartment room in a basement with an extra bed so it was perfect. We just hung out and talked and then fell asleep really late! Then she went to work (Saturday) and I met up with Jaewon Hwang, one of my friends from BYU. 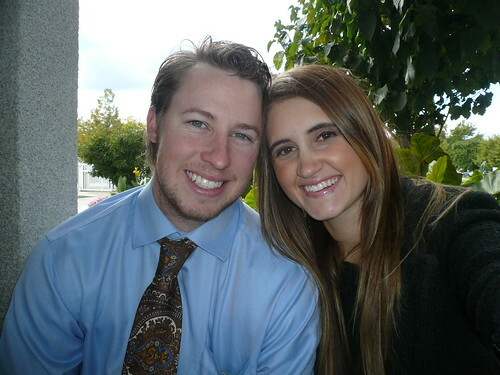 She also was a Marketing major at the BYU's Marriott School of Management. We had Sales Management together and same with Consumer Behavior! She is one of my super cute Asian friends ha. And, I love her style, always. We met up at Kneaders and had their famous french toast. Anyways, the coolest thing ever...I was the last person to talk to and see Jaewon in person...before she got engaged! Her boyfriend (now fiancee) proposed to her in Park City later that day! So glad I was the last person to see and talk to her when she was single haha. Meanwhile, Kevin was golfing at Sleepy Ridge Golf Course in Orem. I was driving around waiting to pick Kevin up so we could change and head off to Bryce & Natalies' wedding. I went to Downeast Basics because I am always in need of those cap sleeved shirts...it is so annoying to me that whenever I go in there I want to buy an off white shirt and brown shirt and they NEVER have them! They have all of these funky colors and then the girls who work there say, yes, we think they should have them too! The ones I have in those colors are old and kind of small...so I guess next time I visit Utah I will go in again and it will probably happen again! It has happened the past few times I have gone in there! Anyways, enough about that. 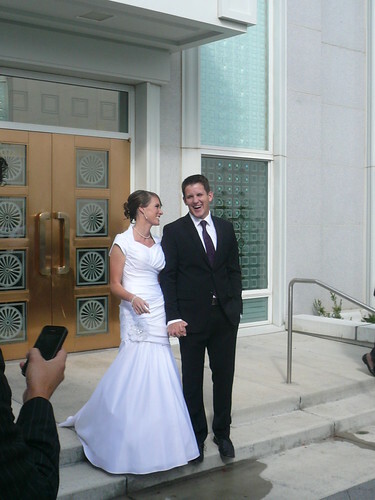 I picked up Kevin and we headed over to the Mount Timpanogos temple, where Bryce & Natalie were to be married and sealed for time and all eternity. Their wedding was beautiful! Kevin & I after the wedding, waiting for them to come out of the temple! Some of Bryce's guy friends! 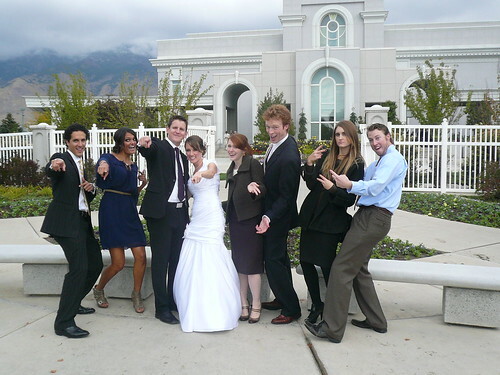 They were all friends from freshman year together at BYU. Note to self: Do not wear that coat in pictures...or at least with this outfit...looks weird ha. Then afterwards we drove to Thanksgiving Point. We first walked around the shops at Thanksgiving Point and then had a catered dinner with the wedding party. The dinner was very good as we were all starving! Then Kevin and I met up with Brandon & Breanne Relf and Dane Nielson. Brandon and Dane played Baseball for BYU with Kevin so it was a little reunion. We met up at The Cocoa Bean and all got cupcakes! 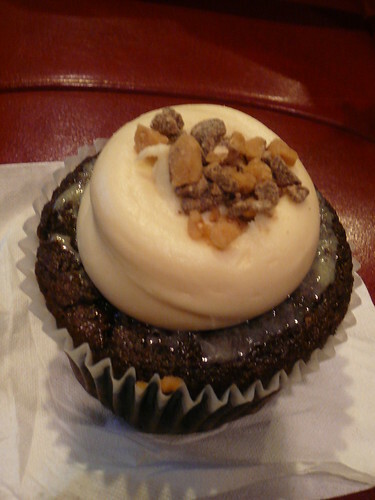 I got the Better Than Whatever cupcake...so good! And...I'm proud to say that I got this cupcake and a peach drink for Kevin for free because I won a Cocoa Bean giveaway from the cute McKinley's blog Haolepinos here! I have been waiting to go to Utah so I could use my coupons for free treats! Thanks girl! We went to sleep and then drove back home to Colorado Sunday morning! That was pretty much our Utah trip! this weekend we went out with our neighbors and had a great time. then our hot water went out. Your weekend looks like it was so much fun and the bride was just gorgeous! My weekend consisted on going on a retreat with my husband's school. I think today we will catch up on all our chores. Ash, great post and pics! Miss you already, come back again so we can do more than just Kneaders (SHOPPING). so fun! and i love downeast basics...too bad they didn't have the colors you wanted! also, that cupcake looks dang good. and you are so pretty! yummmy pic at the end! :) looks like a fun time! So fun. The Mt. Timpanogas Temple is so beautiful! Looks like you had a wonderful time! Awesome pictures! That cupcake looks so yummy! Have a great week! looks like your was fantastic... mine was relaxing with the family! What a fun weekend! 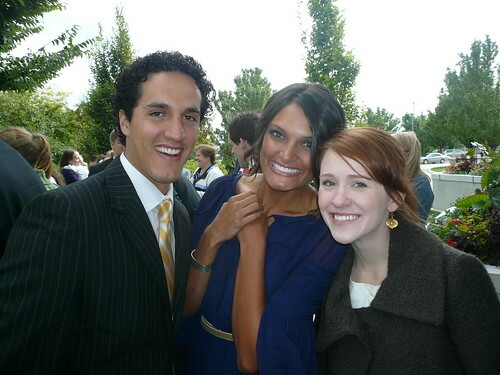 :] And weddings are the best. I haven't been to one in a while though! 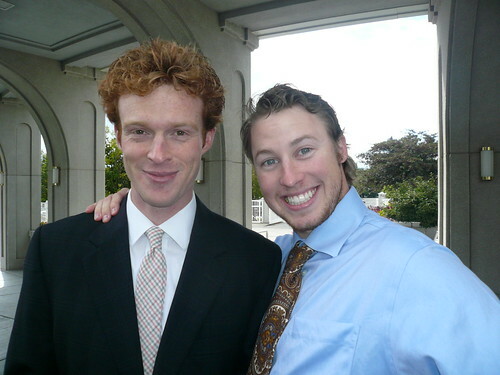 For now I'll just look at gorgeous pictures of everyone else's weddings!